When things don’t go our way and we feel as if we screwed up or failed, us humans can be pros at kicking ourselves when we’re down. This is especially so when we struggle with our self-esteem. We invest heavily in self-criticism and self-judgment when what we really need is self-compassion. We need a willingness to understand what we truly need. Sometimes we fume at ourselves for ages. For some, this might be weeks, but for others, it’s months or even years. A part of us wants to move on, but the other part that exploits even the smallest of missteps wants to persecute us with images of our wrongdoings. We keep reminding ourselves, for instance, about what we did or didn’t do in a relationship. How we should have had the boundaries we now realise were missing. How “if only” we’d foreseen the future, we could have done X and totally changed the outcome. We imagine that they’re having a laugh at our expense. That they’re cackling round the happily-ever-after cauldron with their new flame that, of course, is getting the perfect version of our ex. We repeatedly rub our face in our embarrassment and humiliation lest we 1) are vulnerable and move on or 2) make the same mistake again. Next thing, a breakup or work issue that, for instance, could have taken us a few weeks or months to shake off has gripped our life for a year or few. Self-criticism leads to character-assassinating ourselves for our perceived failures and mistakes without acknowledging something crucial: we wouldn’t have acted as we did if we weren’t trying to get or avoid something. 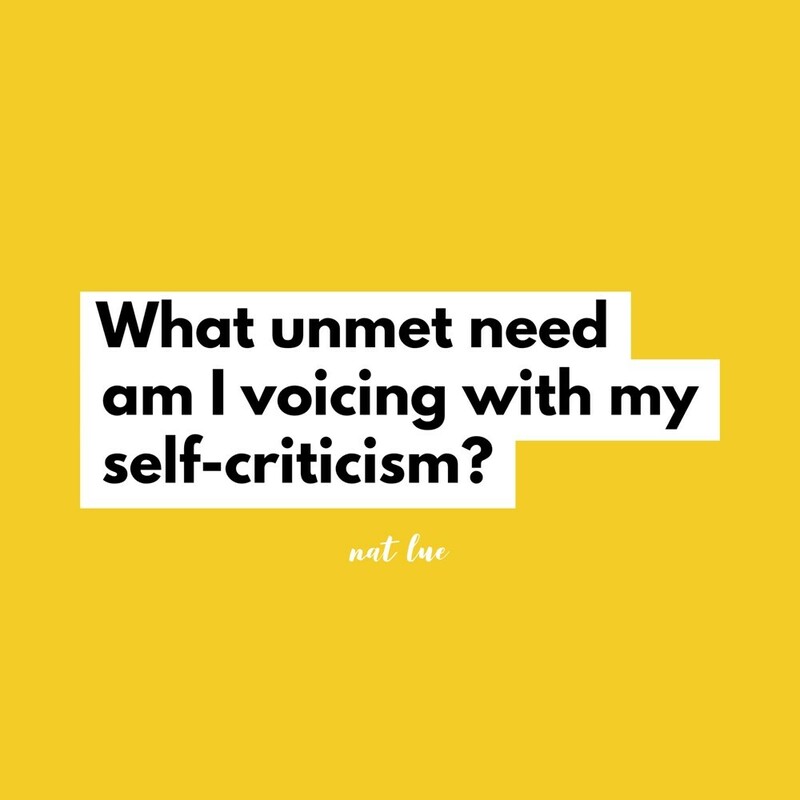 Our criticism and judgement are expressing an unmet need. They’re our response to using an [unsuccessful] shortcut to meet it. The more acute our need(s) is the more intense our self-criticism and judgement. All humans, not just those of us who keep persecuting ourselves for being not “good enough” (because we think it’s the reason we’re not getting what we want) act based on needs. It’s why we strive to get along with others. Everything we do is our attempt to meet our emotional needs. These include safety and security, intimacy, connection and status, amongst others. This makes our ability to get along a critical life skill. When we don’t feel as if we’re getting along in life (prospering, advancing) or that our efforts are leading to the relationship(s) we want, we assume that we’re failing as a person. What we neglect to recognise, though, is that we’ve all been socialised to meet our needs. And not everything we’ve learned is beneficial to that aim. That’s why adulthood is about unlearning all of the unproductive and downright harmful messages and lessons that we’ve learned. Sometimes it seems easier to criticise than to acknowledge the need and learn how to go about meeting it healthily. When we lack self-awareness and self-knowledge, we will try to meet needs with wants. And then we wonder why we feel hungry or even malnourished. Or, we’ll question why we feel OK for a hot minute and then we’re back to square one. We don’t realise that instant gratification is obscuring the need for us to be vulnerable and step up for our needs by delaying gratification. But regardless of whether we do or don’t know and understand our needs, low self-worth and/or denying our needs ensures that we’ll suffer each time we feel we’ve erred or haven’t attained our desires. When we don’t feel worthy of love, of our needs being met, we accept less than what we need, desire and deserve. We settle for crumbs. If in childhood, we also learned that our needs couldn’t be met or that they were going to go unheard or ignored, we’ve trained ourselves not to have needs. Over-responsible adults, for example, were once over-responsible children who thought that hiding their needs was “helpful”. They tried to be less of a burden, to protect themselves from being hurt, to not ask for help, to appear strong all the time, to keep their problems to themselves. Cue trying to be “low maintenance” and “no drama” in adulthood. Next thing, they’re subsisting on crumbs in their relationships, romantic or otherwise. They might feel as if they’re lost or on the verge of exploding in one or more areas of their life. Pretending that we don’t have needs doesn’t mean that we don’t have them. Everything we do (or don’t do) is about fulfilling a need. Attention, affection, approval, validation, acknowledgement, achievement, to be right, control, love, security, connection, to be more important. Whatever it is, there’s always something driving us. Like every human on the planet, if we think that we can take a shortcut that will give us a quick hit, skip the work or dodge vulnerability, we’ll chance it. We’ll try to meet a need while ignoring our very real need, and then beat us up for having done so. It’s like when I get hangry (hungry and angry), which is, thankfully, few and far between these days. Hangry tends to lead to problems, like taking things too personally, feeling insecure and having a meltdown. In turn, I’ve raged at myself for my “foolishness”. Truth is, hangry and its knock-on effects are the result of not giving me enough time to meet basic needs of food, hydration and rest. It’s from ignoring (and exceeding) my bandwidth. I take a shortcut like having no food or eating a frickin’ flapjack while either pushing myself too hard and/or catering to other people’s priorities. In order to meet someone else’s needs (or what we assume theirs are), we sometimes don’t take care of ours. When we try to pander to others socially, and we prioritise looking a certain way, we overlook the need to care of ourselves. We overlook the need to sometimes say no to things that we want to do or could do but that maybe aren’t a fit for us right now. Yes, it’s called delaying gratification or quite simply getting a sense of your bandwidth and priorities. We’ll have a genuine need for intimacy, connection and security, but opt for the “quick solution” casual or painful relationship. We settle for a level of attention and what we think is intimacy. Or, when they say that they’re “not ready for a relationship” or are still hurting over their ex, we hang back. Emotional airbag becomes our role. We might think it’s our job not to make waves, to go along with a less than palatable situation. We act as if we want everything they want. When the relationship doesn’t progress, or we feel invalidated and neglected, we criticise us for being not “good enough”. We blame us for their inability to be or give us what we want. “I’m so stupid”, “I can’t believe I did that!”; “I always eff up!”; ”What does he/she have that I don’t?” We eat ourselves up with self-criticism. What we rarely acknowledge is that we’ve pretended that we need less than we do in actuality. We didn’t (and don’t) give attention to who we are and what we need from a relationship. We don’t acknowledge what in some instances, we were avoiding. The shortcut is the subpar relationship. The shortcut is pretending to be something we’re not. Thinking that we can people-please to influence others to meet our needs is the shortcut. Accepting crumbs now in the hope that they’ll upgrade us to a loaf later equals shortcut. As does the job for the status and to please our parents while ignoring our need for purpose, self-respect, or to have time for our family. Turns out, these shortcuts might be quick solutions but they’re big clues about where we might be selling ourselves short. It’s not that we don’t want to love and be loved, or be happy; we’re often terrified of getting hurt or falling flat on our face. Or both. So, how do you begin to move forward? If self-criticism and harsh judgement were the way to self-improvement, it would have worked by now. You’re using a hammer where you need a hug. Replace self-judgement and criticism with some much-needed compassion. Acknowledge the truth. For example: “It’s OK. I’ll pay more attention to my own needs from now on. I’ll endeavour to have the boundaries that I’ve come to recognise I didn’t have.” Recognise the shortcut so that you stop using it or amend it. Stop hiding from your unmet needs. This means being honest with you first and foremost about what your needs are. They haven’t died, they do exist, and they will wreak havoc in the background if they remain unattended to. If you 1) meet your needs in healthier ways and 2) acknowledge where some needs are already met, they feel less intense and destructive. For instance, many people focus on fulfilling a need for achievement without having acknowledged what they’ve already achieved. So they keep chasing achievement while also neglecting other very real needs. What are you always trying to get or avoid? What do you complain that others aren’t being or doing for you? This offers clues about unmet needs. Become aware of the needs that weren’t met earlier in your life so that you can finally give you permission to live. It will also stop you from inadvertently turning people into parental replacements and putting you in a child role. When we’re honest about why we’re so self-critical, it’s because we feel as if we haven’t fulfilled our ideal image. It’s the fantasy version of who we think we’re supposed to be. Learning to connect fully with your unmet needs paves the way to mourning the fact that you.are.not.perfect. Mourn it. Mourn it hard so that you can get on with the business of being you. This will spare you a lifetime of pain. You won’t spend your life trying to be something that none of us, including you, can ever be. Yes, you might regret not being able to fulfil your ideal image of yourself in this relationship or situation, but at least if you actually connect with your needs and have some compassion, you will no longer hate and berate yourself for it. The post Why you haven’t allowed you to move on: self-criticism is an expression of an unmet need appeared first on Baggage Reclaim with Natalie Lue.